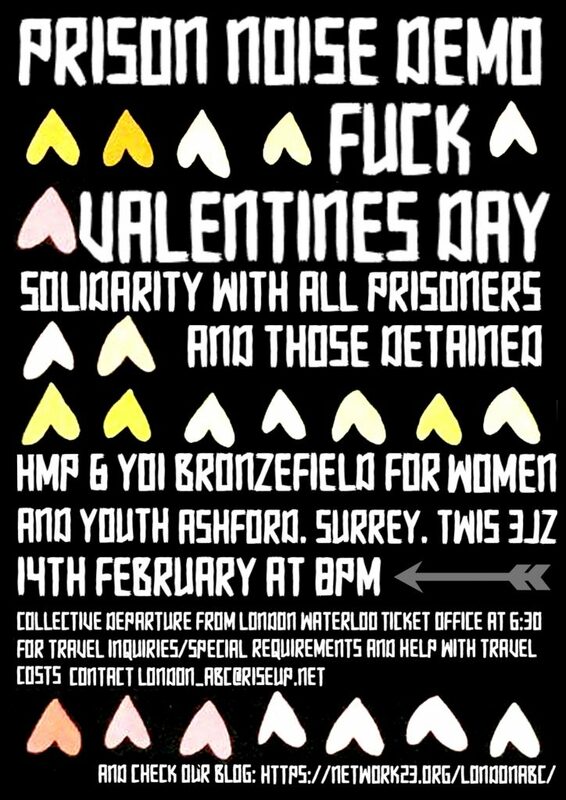 London Anarchist Black Cross has called a noise demo outside of HMP/YOI Bronzefield in Ashford (Surrey) on the 14th of February from 8-10pm. Bronzefield is the largest women’s prison in Europe. It’s the most expensive adult and youth women’s prison in England. At an annual £66,294 a prisoner, it is at least £10,000 more expensive than any other. It was privately built, and is privately run by the outsourcing giant Sodexo. We will go there in solidarity with all of those incarcerated in an oppressive and discriminatory society. We have no love for the state and it’s corporate apparatus of punishment and control. Under a Neoliberal Capitalist regime that destroys all possibility of love and replaces it with capitalist modes of mass consumption we want to express our rage at the cages that seperate us. experiencing child abuse. These facts evidence that the state “violently criminalises vulnerable women, who are overwhelmingly black, brown and/or working class”. We remember Natasha Chine who was murdered by the neglect and systemic failures of HMP Bronzefield and their staff. Natasha was one of nine women to die at HMP Bronzefield since 2010. Since her death in 2016 there have been three further deaths of women found unresponsive in cells at Bronzefield. not just on New Years, and not just within the city. We do not take prison as an unchallengable part of our existence. We do not allow the prison to perform the ideological work of relieving us of the responsibilities of seriously engaging with the problems of our society, especially those produced of sexism, racism, “and increasingly, global capitalism”. The prison is present in our lives and, at the same time, absent from it. friends, families, and support services. Collective departure from London Waterloo at the ticket office at 6:30pm. For travel from Waterloo Station, Group Tickets in advance and on the day for 3 or more people = £7 per person. London ABC can help with travel costs and booking tickets! Get in touch!